One of the best parts of the Christmas season (or worst, depending on how you look at it) is the abundance of goodies. Over the years, I’ve really pared back my baking to keep us from over-indulging. I find that if it isn’t in the house, we don’t eat it. However, to satisfy the sweet tooth in all of us, I do make a few family favourites. Last year, it was chocolate almond biscotti and chocolate caramel pretzels. You may also remember it was my first year partaking in a baking exchange, and I was so excited to get some of my friend Sandi’s decadent shortbread and chewy molasses cookies. This year, trying to be a little more health conscious, I asked my nutritionist friend Karen to share one of her holiday recipes. Karen recently launched her website Nourish With Karen, where you’ll find inspiration for healthier living through better nutrition. Although her website is just off the ground, she does have a few recipes posted, including quinoa chocolate cake (yum!) and sugar cookies made with almond flour. 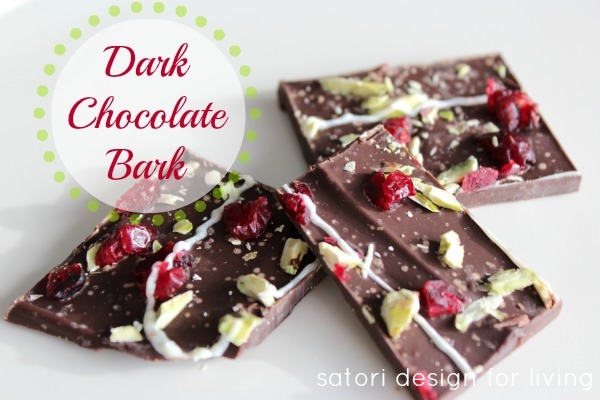 On Monday, Karen stopped by for tea and brought the most delicious dark chocolate bark I have tasted. To add, it’s full of antioxidants, contains magnesium contributing to serotonin levels, and has less sugar than milk chocolate (as she informed me). A decadent treat providing nutrition- bring it on! Melt dark chocolate in a double boiler or in a glass/metal bowl set over simmering water. Stir often until completely melted. Spread the chocolate into a rectangle on the parchment lined pan. Sprinkle with cranberries and pistachios, and allow to set (refrigerating will speed up the setting time). Once set, melt white chocolate, spoon into sandwich bag, cutting a tiny tip out of the corner so the bag can be used like a pasty bag. Pipe white chocolate over the chocolate bark. Allow to set. Break or cut into 16 pieces. Enjoy! Not quite so healthy, but very delicious, is a cookie I remember my mom making every Christmas. I love the crunchiness of the nuts, combined with the subtle almond flavour and slight sweetness of these little gems. Cut butter into sugar and flour. Add vanilla and almond extract and combine. Stir in walnuts and mix gently with hands until it comes together (don’t overwork). Preheat oven to 400oF. Roll dough into 1¼” balls and press down slightly with your fingers. Bake for 12-13 minutes (the bottoms will be golden brown). Remove from pan and cool for about 5 minutes. Roll cookies in icing sugar and allow to completely cool. Link up as many cookie exchange, holiday baking or goody recipes as you want. Be sure to check out a few new recipes too! Thanks for the link party! Your bark and cookies look just wonderful! I love goodies to add to cookie trays that are not cookies… variety is so nice (so I hope you don’t mind that I linked up two Christmas non-cookies)! Your recipes look so good, especially those jingle bell bars. Thanks for sharing! These are so pretty! And easy and fun (the perfect combination for me)! 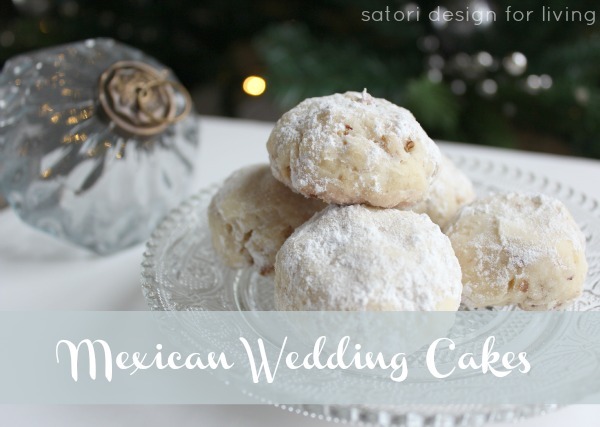 I think I’m going to make them…..I’ll let you know how they turn out! Have a blessed and totally awesome day! It’s the work of my friend Karen at Nourish With Karen, and it is so yummy! Thanks for stopping by! Thanks for stopping by and linking up some of your recipes. Tea and cookies would be lovely. I know we would have so much to chat about. Enjoy your week as well (P.S. Holiday Countdown link party is on Thursday and you can share any of your Christmas projects. Hope to see you again! ).